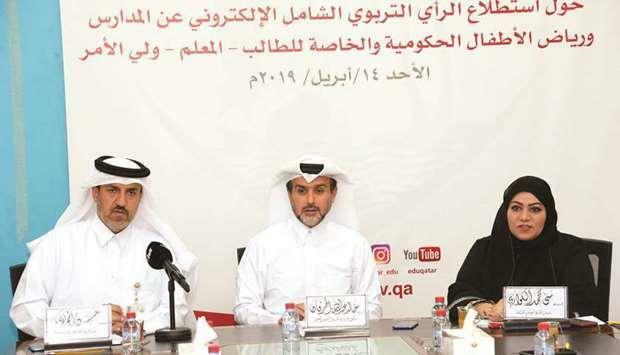 (MENAFN - Gulf Times) The Ministry of Education and Higher Education has announced the launch of a comprehensive educational e-survey on public and private schools and kindergartens. 'We look forward to the active participation of parents in this survey, as the online system provides a greater level of flexibility and the parents can fill out the questionnaire at ease, al-Harqan added. Noting that parents are 'partners in education, he said: 'We are very keen to ensure a developed education system. 'Therefore, I call upon all parents to participate in this questionnaire initiative. 'The indicators extracted from the survey will help promote our education system. 'The online system comes within the framework of the continuous upgrade of services provided by the ministry to all stakeholders in the educational process. The survey targets 365 schools 200 government and 165 private and 20,601 parents.